Welcome to Myth #11 of our 16 blog-series highlighting women’s leadership myths. 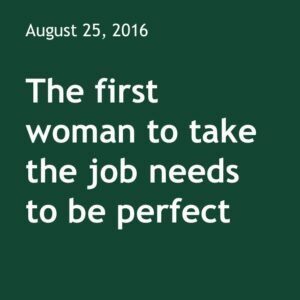 Myth # 11: The First Woman to Take the Job Needs to Be Perfect. We hear this a lot. When an organization (or a nation) considers the first female for an important position, the bar is set very high. As well it should be. Top executives should be smart and savvy, innovative and strategic. They should inspire employees to dream bigger, and challenge all personnel to learn, grow, and adapt. An organization has a right to expect the best from its top hires. But it should not expect more than that. It is often maintained that the first woman in any important position is a trailblazer. In order to open the door for others to walk through, she must be head and shoulders above the competition. She must rise above the fray. Otherwise, she will set all women back. If she is not flawless, the door will slam shut for good. The first woman to hold the job is expected to be an elusive and perfect thing, soaring high above the field. Except women are not unicorns. The first female CEO, CFO, or Chairman of the Board of any organization will be a real person. Like the first male CEO, CFO, or board chair, she will make mistakes and guess wrong. She will succeed and fail, wilt and flourish. If that female executive does a great job, she may stay and continue to add value to the company. If she does poorly, she may be asked to step down. This is the way of things. Gender should have no bearing on any of it. The first woman to take any job may, indeed, open the door for others to follow. But her performance should be judged individually. No one bats an eye when an underperforming male executive is replaced with another male exec. No one says, “Gosh, that last fellow did not achieve. I don’t think we should hire another man.” One man in a key role is not expected to represent all men. No woman in a key role should be expected to represent all women. Individuals and organizations have biases. Do you know yours? Have you ever had a female manager? If so, was she the exception or one of many? How did you respond to her management style? Is your workplace an equitable home for both male and female leaders? Could it be?